As the birthplace of Lingnan culture, all kinds of traditional folk activities are passed down from generation to generation, which are full of special meanings and carry Foshan people’s best wishes towards future and life. Songtang Chuse Spring Festival Cruise has a history of 143 years. Foshan’s Autumn Color rooted in Liang Jin Dynasty, and prospered in Ming and Qing Dynasty. Crossing Tongji Bridge on the Lantern Festival, the 15th day of the first Chinese lunar month, is a big New Year event for many Foshan residents. The Sanyuesan Festival is celebrated on the third day of the third lunar month. As Nanhai is located in a network of rivers in the Pearl River Delta, rowing dragon boat is a popular traditional folk custom. Having lion dancing celebrated with people on every festival and major event is a very typical Lingnan activity. Xiqiao Kwan Yin Cultural Festival is a well-known event in Nanhai that celebrates folk belief. Lettuce party is a folk belief of the Han, which is popular in Guangzhou, Nanhai and Shunde regions on the 26th day of the first lunar month. Shaofanta is a traditional folk custom in the Pearl River Delta marked during Mid-autumn Festival each year. The Memorial Ceremony of Lu Dongbin is celebrated on the 14th day of the 4th lunar month. This is the first time for Foshan Lion Dance to show as a main role at the CCTV Spring Festival Gala. 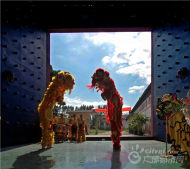 The first art gallery for lion and dragon dace was landed in Chencheng District. A grand Foshan folk festival comes again! Foshan dragon boat is a pioneer in Guangdong and even in China. The 586-year-old Yanbu dragon boat “wakes up”! In the morning of May 29, the annual Yanbu dragon boat awakening ceremony was held in Longchong Village, Yanbu Community. The event of celebrating North Emperor’s birthday starts today! The event of celebrating North Emperor’s birthday which has a history of one hundred years grandly starts! Float with elaborate workmanship and colorful decorations is one of the highlights of this year's Chinese New Year celebration in London. Where to the spend the Spring Festival in Lingnan area? Of course it’s the “national famous historical and cultural city " Foshan!